Patented probiotic strain with antioxidant and anti-inflammatory properties. Consumption of Lactobacillus fermentum ME-3® boosts production of the major cellular antioxidant glutathione. 20 years of research and clinical studies support the efficacy of L.fermentum ME-3® for cardiovascular and metabolic disease prevention (reduction of oxidized LDL, cholesterol and triglycerides), anti-aging (systemic antioxidant effect), detoxification (liver function support). Lactobacillus fermentum ME-3® was isolated in 1995 at the University of Tartu, Estonia, from a healthy one year old child. The strain displays excellent probiotic properties, resistance to gastro-intestinal environment (bile acids, low pH), lectin profile suitable for adhesion to gut epithelial cells. QPS status, safety demonstrated by human clinical trials and long history of human consumption without side effects. ME-3® is one of the very few probiotic strains to contain a complete enzymatic system enabling synthesis, uptake and redox regeneration of reduced glutathione. Glutathione is a major free radical scavenger and antioxidant, used by the enzyme glutathione peroxidase to inactivate harmful peroxides. Glutathione also contributes to maintain other antioxidants like vitamin C and vitamin E in their active forms. ME-3® consumption leads to an increase of the reduced/oxidized glutathione ratio in the body, and to an overall improvement of oxidative status. In addition to its effect on glutathione pathways regulation, L. fermentum ME-3® expresses Mn-SOD, a potent antioxidant enzyme. This is another mechanism by which the strain contributes to protection against oxidative damages. Several properties of ME-3® make it a strain of choice for use in cardiovascular health formulations. The most remarkable is its capacity to reduce LDL cholesterol oxidation. Oxidized LDL (oxLDL), whose formation is favored by increased oxidative stress, inflammation, high homocysteine levels, is a major contributor to atherosclerosis. ME-3® consumption also raises the levels of paraoxonase enzyme in the blood; paraoxonase is an antioxidant enzyme which protects LDL particles against oxidation. Paraoxonase also inactivates toxic derivatives of homocysteine, a molecule associated with inflammation and cardiovascular disease. Another beneficial effect of ME-3® is the regulation of lipid metabolism. 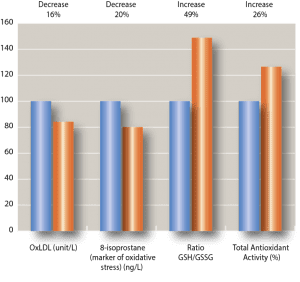 L. fermentum ME-3® consumption led to a reduction of borderline high LDL-cholesterol and triglyceride levels in several food interventions and clinical studies. LDL-C to HDL-C ratio, oxLDL values, and postprandial lipemia were also improved. L. fermentum ME-3® shows potent anti-bacterial activities against several gastro-intestinal pathogens: E. coli, Salmonella enterica, Shigella sonnei (in vitro studies); Salmonella typhimurium (mouse model for enteric fever), Citrobacter rodentium (mouse model for E. coli infections). These anti-microbial properties correlate with the production of lactic acid, acetic acid and succinic acid. A recent animal study on obese, diabetic mice has shown more remarkable benefits of L. fermentum ME-3® consumption. Animals treated with the probiotic had reduced weight gain compared to controls, as well as improved glucose tolerance. Liver health was improved with a 40% reduction of fatty acid accumulation (ME-3® prevents fatty liver/NASH) and lower liver inflammation markers. L. fermentum ME-3® also exerted a protective action against glycation-induced kidney damage. Kullisaar et al. 2003. Antioxidative probiotic fermented goats’ milk decreases oxidative stress-mediated atherogenicity in human subjects. Br J Nutr. vol. 90(2), pp. 449-56. Mikelsaar and Zilmer 2009. Lactobacillus fermentum ME-3 – an antimicrobial and antioxidative probiotic. Microb Ecol Health Dis. vol. 21(1), pp. 1-27. Kullisaar et al. 2010. Complete glutathione system in probiotic Lactobacillus fermentum ME-3. Prikl Biokhim Mikrobiol. vol. 46(5), pp. 527-31. Truusalu et al. 2010. Immunological, antioxidative, and morphological response in combined treatment of ofloxacin and Lactobacillus fermentum ME-3 probiotic in Salmonella Typhimurium murine model. APMIS vol. 118(11), pp. 864-72. Kullisaar et al. 2011. An antioxidant probiotic reduces post-prandial lipemia and oxidative stress. Cent Eur J Biol. vol. 6(1), pp. 32-40. Mikelsaar et al. 2015. Regulation of plasma lipid profile by Lactobacillus fermentum (probiotic strain ME-3 DSM14241) in a randomised controlled trial of clinically healthy adults. BMC Nutrition doi 10.1186/s40795-015-0020-z. Rehema et al. 2015. Proteomic proof that a probiotic elevates glutathione levels in human serum. Open Life Sci. vol. 10, pp. 193-200. Sepp et al. 2018. The effect of Lactobacillus fermentum ME-3 on the intestinal microbiota and urine polyamine content: a double-blind placebo-controlled pilot trial. J Functional Food vol. 48, pp. 430-8. Please contact us for more information about L. fermentum ME-3.